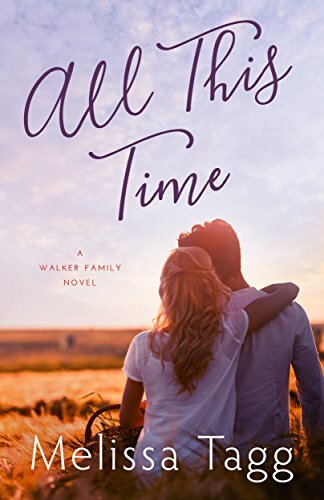 "All This Time" is the conclusion to Melissa Tagg's Walker Family series and it is an amazing story, but one I was so sad to finish as I want to read more! Raegan has always felt more for Bear than just friendship, and when he left a piece of heart went with him. However, fear and a secret she has been hiding from everyone kept her from flying out of the country to see him. Raegan has also been keeping another secret that is discovered when Bear returns back in town suddenly. Bear and Raegan both have things from their past to work through, and family is at a root of this as well. Raegan's family is so close-knit and Bear is yearning for a better family tie. As Bear settles back into life in Maple Valley and adjusting to his new normal, the past comes closer than he had imagined and leads him to question what he has been holding onto and what he has allowed to hold him back. I absolutely loved this book and really this entire series! I love how this story focused on Raegan and Bear (finally! ), but the rest of the Walker family were all a part of it as well. Both Raegan and Bear are dealing with a lot and Melissa does a great job with addressing these issues and working through them, even with some humorous moments sprinkled in. The characters, the town, everything just comes so alive in Melissa's books that it is as if I am a part of the story and it is like saying goodbye to real friends at the end of the book. I am looking forward to what Melissa will write next, maybe a new family and town to draw us all into?!" Jane Kirkpatrick's "All She Left Behind" is a historical romance and is based on a true story. Jennie is a natural healer, meaning she uses herbs, plants, things of this kind to help out her patients. However, her ultimate dream is to be a doctor; however this is not really accepted at this time and the path is not really going smooth for pursuing her dream. This is such a well-written story filled with so many vivid details and emotions. Jennie has not given up on her dreams and she perseveres through trials and is an inspiring main character throughout the book. I love the detail with which Jane writes and found everything with the plants and herbs, the natural healing fascinating to read and learn about. This is a great read and one not to be missed for historical romance fans! This is such a great coloring book! It is a nice size, small enough to easily toss into a bag to take with you to color in on the go, but not so small that it is hard to color or lacking detail. The pages are nice, thicker quality as well. I love the details included in the pictures, some are more intricate than others giving this a nice variety overall to the book. I have the Paris copy as well and this is another great addition of the kind! Clare will face the greatest fight of her life, as she struggles to reclaim her son from the Shawnee Indians now holding him captive. But with the battle lines sharply drawn, Jacob's life might not be the only one at stake. When frontiersman Jeremiah Ring comes to her aid, can the stranger convince Clare that recovering her son will require the very thing her anguished heart is unwilling to do-be still, wait and let God fight this battle for them? Lori Benton was raised east of the Appalachian Mountains, surrounded by early American history going back three hundred years. Her novels transport readers to the eighteenth century, where she brings to life the Colonial and early Federal periods of American history. When she isn't writing, reading, or researching, Lori enjoys exploring and photographing the Oregon wilderness with her husband. She is the author of "Burning Sky," recipient of three Christy Awards, "The Pursuit of Tamsen Littlejohn," Christy-nominee "The Wood's Edge," and "A Flight of Arrows." Lori Benton has created a beautiful story of adventure and heartache as well as one that is inspiring and filled with hope. It was so easy to become completely engrossed in the story and transported to a different era and completely different world from today. Clare is an amazing main character, she displays strength in the mdist of intense trials. Jeremiah's life has not been easy as well and yet he displays strength and compassion toward others. It would be so easy to wallow in despair over hard times, but these two characters are great examples for pushing through and having faith. I absolutely loved this book, it is excellent historical fiction and one not to be missed for fans of this time period. Did the president's politics interfere with the lives of U.S. service members? Don't miss Randy Singer's new book! Randy Singer has created an intense read, a political suspense fiction read, that could non-fiction in the day that we currently live. "Rule of Law" is a book that will have you completely engrossed in the story, and having you thinking and analyzing the whole way through and after you finish reading. There are a lot of characters and the setting and point of views go back and forth, but it is so easy to keep everyone straight and the chapters are short, which helps with this as well. So many lives intersect and Randy does an incredible job with tying everything together and really creating a clear and accurate picture of the various roles that people play. I was on a John Grisham kick years ago after I read one book by him, I read to read all of the others. Randy is right up there on the same level with John as far as his writing and the multiple layers to the story that will slowly be unraveled and revealed throughout the book. I highly recommend this read that is so current and appropriate for now. *Thanks to the Litfuse Publicity Group for including me on this blog tour and for the complimentary copy of this book! "The Two of Us" is the latest contemporary romance novel from Victoria Bylin and it is my favorite one yet from her! Mia has traveled to Vegas for a wedding, not her own as she has been engaged twice, but not made it to "I do" once. This wedding is for her younger half-sister, Lucy and her fiancée whom Mia has not met yet. Lucy is pregnant and Mia does not believe that is a good enough reason to get married or enough to make this marriage last. Mia likes to have answers and is organized and presents calm and all put together, while Lucy is more carefree and go with the flow. Mia's world is tilted when she meets Lucy's fiancée Sam's best man and mentor in life, Jake. Jake has taken Sam under his wing as his mother Connie was Jake's former partner on the police force until she was killed in the line of duty. Mia has her heart and her mind set on getting accepted into Medical Mission and she has made this commitment to God to serve Him in this capacity as she has given up on love. However, she feels torn after meeting Jake and Sam and knowing that she is going to have a little niece or nephew to love. As Mia is forced to prove that she can adapt quickly and make changes, she moves to Echo Falls and takes over working as a general practitioner, while at the same time pursing her dream, yet she finds herself spending more time with Jake and finding herself a part of a family once again. This is such an incredible book filled with loveable characters, a cute town and so many storylines. Mia and Jake are the two main characters, but really Sam, Lucy, Claire and Frank are right up there as well. Claire's health struggles are all too common and so relatable as is Frank having to learn to cope with this and Lucy sharing her love and compassion and learning how to best care for Claire. Sam and Lucy are adjusting to married life and a complicated pregnancy. Jake has been struggling with his partner's death and he feels he needs to honor her and that he owes her in a way and his dream of running a camp has been his focus. Mia has her dream for her job and has lost hope for love and a family. There are just so many emotions that you will experience while reading this, there is just so many layers to the characters, the stories and I would love to spend more time in Echo Falls, if Victoria chooses to write more books set in this town. This is a book that will have you wrapped up in the characters' lives and celebrating with them in the high times and rooting for them and praying for strength during the lows. This is an amazing cookbook! Each recipe has pictures to go along with it and you will be practically drooling as you page through this book! There is a great variety to the recipes as well and I love the descriptions that are shared for each. There are various traditional cookies shared for different cultures that have been shared through the years and staples that are a must-have for your holidays. However, there are also several unique recipes and types of cookies that I have never seen or tasted and I cannot wait to try them out this year and many years to come. This is an excellent addition to add to your collection and to share with others! This is a great resource to use with children! It is entertaining, interactive and all at the same time, children are learning! I love the illustrations that are included, they are so vibrant and so full of detail. My kids thoroughly enjoyed these and noticed many little details and it just added so much to the stories. A wonderful job was also done with being able to apply this to your own life and really helping kids to see how faith can be lived on a daily basis and how the truths still apply today. I highly recommend this! Oh my goodness, I love this book! I have a daughter and daily I pray asking for guidance as society is so different from when I was growing up and yet some of the struggles are the same, some are going to be even more so challenging. I love the layout of this book as there is a reading followed by multiple prayers relating to the topic, then followed by "girl talk" conversations to have with your girl, and there are conversation starters included for three different age groups based upon where your daughter is at (I love this part especially!). This book is divided into 5 main subjects: identity, heart, mind, relationships and purpose, and then these are further divided into topics/chapters. The identity one is the section that really resonated with me as girls are starting at such a young age to be caught up in the "drama" that I do not even remember until late middle school and social media plays a big role in this, as girls are comparing themselves to others, trying to get a large number of "likes" and basing their worth on feedback from others. This is an excellent book and a must-read for parents of daughters. I knew from reading the back cover blurb that I was going to enjoy this book and I was not disappointed in the least! It is so easy to have what we do, the roles we fill, the tasks we fulfill each and every day define who we are; however that is not who we are and not what makes us who we are. Jerusha tackles this while discussing Jesus' I Am statements. Divided into eleven chapters, each one discusses different thoughts, different aspects, a varying toxic belief that women may think and believe about themselves. Each chapter ends with personal reflection and/or group discussion questions and also additional resources that could be read to add to the topic more fully. This is a great read! It was easy for me to get into the book and I felt as if Jerusha was talking with me, not "preaching" at me; her writing style flows nicely. She does a nice job with tying together scripture and her personal stories as well as adding in things to really get you thinking and apply the principles to your own life. This is an inspiring read and one I would highly recommend for women to read! "All in All" is a journaling devotional book by Sophie Hudson that is wonderful for teenage girls right on up to age 100. This journal and devotional book will take you through 100 days, 100 days that will show you, remind you, teach you that Jesus is with us wherever we are, going through everything with us and He is the one whom we each need in our lives. Sophie shares a short (on average 1 1/2 pages) devotional reading for each day. Then the reading is followed up with Biblical text to read and then questions to answer and journal prompts to fill in and answer. The journaling prompts will help each of us to reflect on where we are at in our lives, the role that Jesus is playing and changes that we may need to make. This is a beautiful edition, hardcover with a nice texture to the cover. It is all done in a very soothing, pretty color combination and there is ample space for journaling throughout the book. It is also a nice size to take with you wherever you are, it will bit in a bag, easy to pull out and work through the day's reading and journaling. I highly recommend this book, it would make a lovely gift! "So Close to Amazing" is an excellent read for women! KariAnne Wood is honest, funny and just so real! This name may sound familiar as KariAnne writes the award-winning lifestyle blog Thistlewood Farms. I have to be honest she nor the blog were familiar to me, but I have checked it out and it is one I am going to faithfully follow! Anyways, back to this book...first of all, look at it, I love it! It has such a unique cover and it is a great hardcover edition that is just so pretty and so different. Inside, the pages follow the same color scheme (love it!). This book is divided into chapters, each chapter focusing on a different life lesson. Each chapter KariAnne shares a personal story, many of which you will be able to relate to in some capacity I'm sure, as I was able to, a quote is highlighted and shared all nice and pretty on it's own page and there are DIY projects shared throughout as well. Overall, this is a great collection of stories, inspiration and encouragement from KariAnne and some cute ideas of projects I now want to try! For more information about this book, go here! And be sure to check out KariAnne's blog as well: here! Carol J. Post's latest romantic suspense is available now! "Reunited by Danger" is a book that starts right off with action, questions to be answered, and characters who you cannot wait to find out more about! This is book #5 in the Cedar Key series, but it is find to read as a stand-alone novel as well; however I highly encourage you to go back and read the others as well as they are amazing! Amber had not wanted to attend her high school 10 year reunion, but knew she must after receiving a message on Facebook from one of her high school friends asking that she come as she had 6 months to live due to battling cancer. As Amber sits at her reunion, she is informed that her friend passed away 2 months ago and Amber realized that someone wanted to be sure she was there. Before she has time to process this, a scream pierces the air and Amber finds another former friend dead outside. Amber, now a police officer, was really on the other side of the law in high school and she is surprised to find that a former acquaintance from high school is a detective; together they find themselves in the midst of the action as they struggle to find out who is out to get revenge on this group after 10 years. I loved this book! It is fast-paced and well-written. I love how Carol shares bits and pieces of the characters' pasts and their relationships with each other and their stories and ties them in with what is going on now for them all. The characters are so likeable and Amber is such a great, strong main character, although Caleb is right up there as well in my opinion! The secrets, suspense, romance and action make a fast, great read that will leave you content with the ending, yet sad that the time spent with the characters is done.